Aleut Research Program Published Results: Rubicz, R, TG Schurr, PL Babb, MH Crawford. 2003. Mitochondrial DNA variation and the origins of the Aleuts. Human Biology 75(6):809-835. 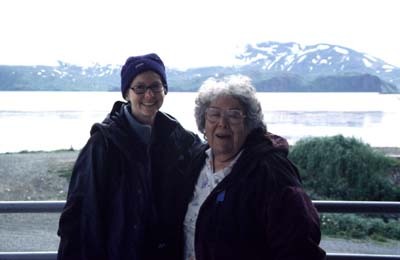 Researchers from the University of Kansas (Dr. Michael Crawford and Rohina Rubicz) and an Aleut elder, Alice Petrivelli, collected DNA samples from people of the Aleutian Islands during the summers of 1999 and 2000. Communities that participated included Atka, Nikolski, and Unalaska in the Aleutians, St. Paul and St. George in the Pribilofs, and Anchorage on the Alaskan mainland. Additional samples were collected in the summer of 2001 from participants on Bering Island in the Commander Islands. This project is a molecular genetic study of the Aleut people which traces their ancestry through the mother's line by analyzing mitochondrial DNA. Native American peoples have four major lineages of mitochondrial DNA: A, B, C, and D. The results of this project are as follows: out of 170 Aleut people who participated, 120 had the D mitochondrial lineage and 50 had the A mitochondrial lineage (in other words, 71% D and 29% A). There were no non-Native American mitochondrial types. Summary of mitochondrial DNA results Total # of Participants = 170 Individuals with A = 50 (29%) Individuals with D = 120 (71%) This mitochondrial DNA pattern is unique to the Aleut population; no other Native Americans have this combination of high frequencies of D and low frequencies of A. In comparison, the Eskimo/Inuit peoples also have A and D, but in the opposite pattern of mostly A and a little D. Mitochondrial type A is highest in Arctic and Subarctic populations, B is found mainly in populations of the Southwestern United States and Central America, C is highest among South American Peoples, and D is also high in South America (and nearly absent in North American populations except for the Aleuts). A, C, and D are also present in Siberian populations. A portion of the mitochondrial DNA, called the control region, was sequenced for 163 of the samples. This was done in order to obtain more detailed information on the relationship of Aleut mitochondrial DNA to that of other populations. The sequencing revealed that there were 27 different types of mitochondrial DNA (called haplotypes) present among these individuals. Haplotypes which were unique to the Aleuts were dated at 6,539 +/- 3,511 and 6,035 +/- 2,885 years old. This chronology is consistent with archaeological evidence for the settlement of the Aleutian Islands. The Nikolski Village on Bering Island in the Commander Islands, Russia Analysis indicates that the Aleuts are most closely related to the Chuckchi and Siberian Eskimos (of the Chukchi Peninsula) rather than to other Native American or Kamchatkan populations (Koryaks and Itel'men). This supports the archaeologically-based hypothesis that the Aleuts crossed the Bering Land Bridge that once connected Siberia and Alaska, and entered the eastern Aleutians, rather than island-hopping from the Kamchatka Peninsula into the western Aleutians. Dating of the Aleut mitochondrial DNA lineages indicates that the Aleuts emerged as a separate population by at least 6,000 years ago (and perhaps even earlier). It is likely that they settled the Aleutian Islands at this time, and continuously occupied the region up to the present, as there is no DNA evidence that the original Aleutian Island population was replaced by a more recent migration into the area. The results of a collaborative study done by Professors Dennis O'Rourke and Geoff Hayes on the DNA of ancient Aleutian Island individuals show that their mitochondrial DNA is indistinguishable from that of the living Aleuts. And finally, there is some evidence for genetic differences among people traditionally inhabiting different regions of the Aleutian Island Chain. This makes sense considering the Aleutian Islands are spread across a great distance (approximately 1200 miles) and travel between islands may have been difficult due to the adverse weather conditions which are frequent in the area. The DNA samples from the Aleuts of Bering Island are currently being analyzed, and preliminary results show that this recently established population does not contain any haplotype A mtDNAs, reflecting the unique history of this island population. These individuals trace their ancestry mainly to western and central Aleutian island communities. During the summer of 2004 we plan to re-visit the communities of Atka, Unalaska, St. Paul, and St. George in order to expand this study. We hope to include additional participants, and the analysis of Y-chromosome DNA, which is inherited from father to son, for a more complete picture of the molecular genetic composition of the Aleut people. If you participated in this study and would like to know your mitochondrial DNA type, please send a signed letter of request to: Rohina Rubicz Department of Anthropology 622 Fraser Hall 1415 Jayhawk Boulevard University of Kansas Lawrence, KS 66045.